This production, developed with two writers and a cast of three actors, explores a few of the most famous Shakespearian scenes from different angles. 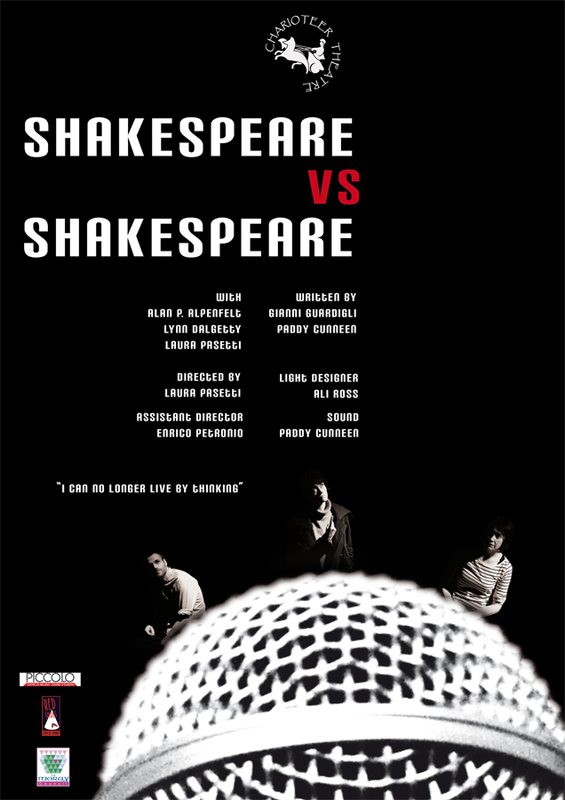 The dynamic and the power of Shakespearian language is set in a contemporary context on stage. Two actors, running a radio program on Shakespeare, are stuck in a Scottish radio station after a terrible disaster that has affected the whole world and possibly destroyed the entire population. Someone might be out there in the same situation. So they decide to continue to with the program and perform Shakespeare for any possible listener. Through their interactions with each other, the actors unconsciously begin to play out the themes inherent in the text until they reach a climax of conflict and truth within their own lives. The observer will experience a thought provoking tapestry of Man’s lighter and darker sides, which either enable or disable him to tread his path and fulfill his true potential. The audience will witness some of its favorite scenes from Richard The Third, Measure for Measure, Julius Caesar, Romeo and Juliet, Julius Caesar and others. The production aims to target audiences from the age of 15 onwards. It is of particular interest to those studying English, Drama or Philosophy. However, it has appeal to any person having an interest in Classical Theatre and its relevance today. Lo spettacolo è nato da un lavoro d’ ensamble in cui due scrittori e un cast di tre attori si sono trovati per un periodo di studio e sperimentazione. Durante questo periodo hanno esplorato alcune delle più note scene di Shakespeare estrapolandole dal loro contesto. Gli autori – Gianni Guardigli e Paddy Cunneen – insieme al cast formato da due attori scozzesi e un’attrice italiana, hanno approfondito la dinamica dei rapporti e dato rilevanza alla lingua del Bardo attraverso una storia che racconta il teatro, rivela i lati più veri dell’essere umano e allo stesso tempo induce a riflettere. Due attori che recitano Shakespeare per un programma radiofonico, rimangono bloccati nella stazione radio dopo un terribile disastro che ha colpito il mondo intero e forse distrutto l’intera popolazione. Decidono di continuare il programma e recitare Shakespeare nella speranza che qualcuno stia ascoltando. In una situazione estrema, attraverso il loro rapporto, inconsciamente cominciano a recitare le situazioni racchiuse nei testi di Shakespeare fino a raggiungere un climax di conflitto e verità all’interno della loro stessa vita. Il pubblico potrà vedere recitate alcune delle scene più note da Riccardo III, Misura per misura, Giulio Cesare, Romeo e Giulietta e altri.